There is just something about taco salads that get my stomach growling. I can't turn away! Need. Taco. Salads. A favorite so far: Crock Pot Costa Vida Chicken. 1 bottle zesty italian dressing, some chili powder, cumin, and garlic. Throw it in a slow cooker along with the chicken. De. Lish. The hardest part about it is remembering to defrost the chicken the night before. A staple for all taco salads? Del Taco's spicy Del Scorcho packets. Every time we run to Del Taco, I harangue the drive thru attendant for MORE SAUCE PACKETS. Hello, my name is Ashley, and I am a sauce packet hoarder. Del Taco: I would not have to do this if you would just sell the stuff IN BOTTLES! New Food Obsession #2: Strawberry Freezer Jam. A slice of cottage bread, a slather of butter, and two heaping spoonfuls of jam. 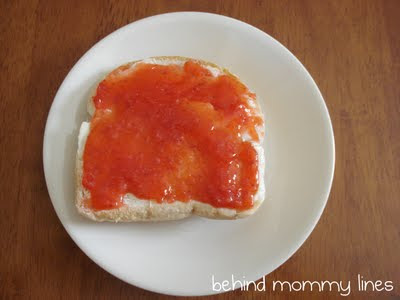 If you have a hard time keeping the jam confined to the slice, then you are doing things right. I'm not going to lie to you, making jam is kinda difficult. Especially when the directions tell you to let it set at room temperature for 24 hours, and you have two four year olds pitching a fit that "I just want pretty strabewy jams!" Making them wait a whole day? Tough. The next day when I went to spread it onto some toast, they informed me they just wanted to drink it from the jar. Being a good mother, I shoved the toast on their plate and told the two blondies WE DON'T DRINK JAM. I don't know if it's bad, but I NEVER defrost ANY meat when I crock pot. No food poisoning here, and always tastes fine! I really want to try that recipe! 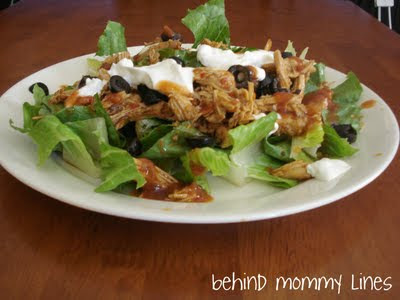 Ashley, you should try Salsa chicken too- just add about a cup or so of salsa (I just cover the top) to chicken in the crock pot, let it cook for the day, and then shred it about 30 min before eating- add some taco seasoning and black beans if you like them, and it's super delicious on salad. Yum...I'm gonna have to try that chicken. I'm all about seasoning with dressing! Ditto the comments about using frozen chicken. I have done it a few times and never noticed a difference. Good HEAVENS that looks good.